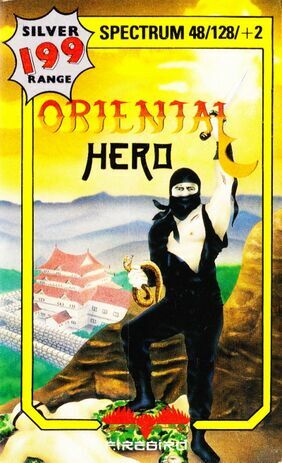 Oriental Hero is a scrolling action game for the ZX Spectrum, by Tron Software and Firebird Software. It was a sequel to Ninja Master. The ninja from Ninja Master goes to Outer Mongolia to face off against Zerwin the Wizard to take the title of Supreme Oriental Combat Master. An overly loud and annoying title theme comparable to a door being knocked very loudly and at incredible speed. Unfair difficulty, caused by seriously awful hit detection and the fact that ALL of the enemies can kill you in one hit. Ugly and eye-searingly bad graphics, even by ZX Spectrum standards. Anti-climactic ending. When you beat Zerwin, the game just flashes a "mission complete" text on the screen and goes back to the title screen. This page was last edited on 25 August 2018, at 09:50.